The Illinois budget debacle has left both sides bruised, but state comptroller Susana Mendoza has emerged from the fight more powerful than ever. Talk to legislators who used to work with Susana Mendoza. Talk to her soccer coaches from grade school or college. Talk to her political opponents. Or talk to Rahm Emanuel, who tussled with Mendoza when she was city clerk. They’ll tell you she’s tough. They’ll tell you she wears you down—or wins you over—with argument, with cheer, with legwork. The petite 45-year-old Democrat is a packet of athletic energy. She walks fast. She talks fast. Robin Williams fast. If, that is, Robin Williams had tenaciously stayed on message. After 20 years in politics, and now in her first statewide office, Illinois’s new comptroller has emerged as arguably the most forceful combatant in the trench warfare over the state’s dire finances and mounting billions in debt. Her outsize role took shape as the spring 2017 budget battle in Springfield was coming to a dramatic head. As the political rhetoric heated up, Mendoza, more than any other political figure with skin in the game, brought to the fore in a vivid way the toll the budget crisis has taken on Illinois residents. Though she sometimes took Democrats to task, she laid the bulk of the crisis squarely at the feet of Governor Bruce Rauner. The fight she waged with him frequently grew personal. Rauner complained that Mendoza was “on a mission to create a crisis.” Mendoza labeled Rauner “unhinged” and Illinois’s “worst governor.” Ugly as it got, the dueling turned the comptroller into one of the state’s rising political stars. And sometimes it got to her. Early on day two of a three-day swing in April through central and southern Illinois to connect with constituents beyond her base in Chicago, Mendoza climbed into the passenger seat of her office’s newly bought but used 2016 black Ford Explorer. Mendoza’s Republican opponents had made an issue of the $32,000 purchase. GOP functionaries, Mendoza said, had been “stalking” her as she used it, ostentatiously taking pictures as she entered and exited the SUV. The chairman of the Illinois Republican Party, Tim Schneider, called buying it “outrageous” in light of the state’s budget woes. But its six occupants, each with multiple phones and laptops, and now deep into the southern Illinois tour, might have wished it were roomier. In public, Mendoza has insisted on maintaining the anonymity of the woman, whom she calls Mary, though that’s not her real name. Diagnosed with muscular dystrophy at age 4, Mary has lost virtually all voluntary use of her body and is at risk of losing a critical part of her state-sponsored insurance. 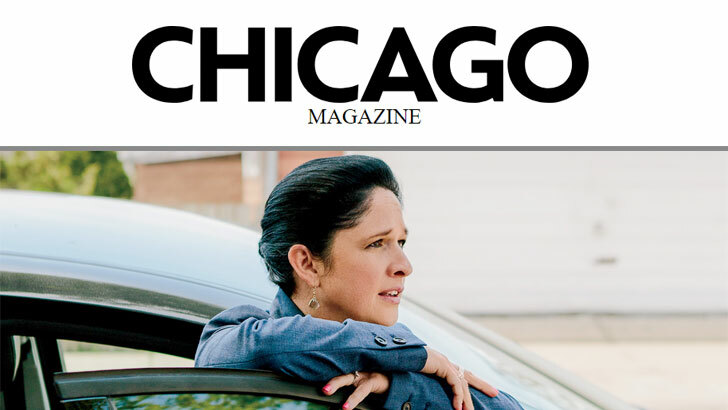 Mendoza first spoke of her publicly at a March 20 speech at the City Club of Chicago. It was a tough-edged talk meant to highlight the cruel consequences of Illinois’s nearly two-year-long failure to produce a state budget. Her diatribe was, as usual, infused with an underlying sprightliness and delivered with a nice-mean squinty smile. Yet when Mendoza came to Mary’s story, her engine flooded. She paused, unable to get the words out without crying. Mendoza, who lives in Portage Park with her husband, David Szostak, and their 4-year-old son, learned about Mary’s plight in one of the first constituent emails she received. It arrived in December 2016, on the day she took office after defeating Republican Leslie Munger, and had been typed with a special mouse that allows paralyzed users to select characters with slight movements of the head. Mary explained that because the state was behind in paying the insurance agency that provided for her 24-hour in-home care, she was about to lose assistance. “If my nursing care is cut off,” she wrote, “it would be catastrophic for my health with potentially fatal consequences.” She added that her mother was dying of cancer, and if Mary were moved to a hospital, she would likely never see her mother again. Mendoza worked the bureaucracy to ensure money for Mary’s care, which comes to Mary through her father’s benefits. He worked for the state for 40 years and was in a class of employees who could rely on their insurance plan to fund lifelong comprehensive health care for any severely disabled children they had. It is not Medicare or Medicaid, but a plan Mary’s father paid into over decades. Because Illinois’s lawmakers and governor had not yet passed and signed a budget, there had been no funds authorized for a variety of social services. In normal times, this money would have come either directly from the state agencies or through providers, such as the insurer that pays for Mary’s care, that rely on the state to pay them back. In normal times, individual hardship cases would have not come through the comptroller’s office. The comptroller’s job ought to be like a bookkeeper’s. The office is charged with writing checks from state accounts to cover what the state spends. But even while operating without a budget, the state continued to collect and spend billions of dollars, of course. The Center for Tax and Budget Accountability calculates that for fiscal year 2016 the state brought in around $30.4 billion for the general fund (the big pot from which most costs are covered). But that’s $9.4 billion short of what the state was committed to pay out. Without appropriations to set spending, the comptroller had to perform the job of triage nurse, deciding which payees got their money sooner and which had to wait. (Passing a budget will hardly make the state’s problems disappear: As of late May, Illinois had a $14.5 billion backlog of unpaid bills that will take years to pay.) Mendoza says that when she campaigned she knew she’d be wading into a budget mess but did not expect to rule on matters of life and death. The much-anticipated stop at Mary’s house seemed to exemplify for the comptroller what was at stake in her new job. The visit took place in a room off the kitchen, where Mary sat in a wheelchair before an array of computer screens, her body atrophied and bent, pencil-thin legs folded under a skeletal torso, a ventilator keeping her airways clear. Mendoza approached her. “I want to thank you, Mary,” she said. “Your letter really let me know what my job is. I think of you every day, and it helps me do what I do. We’re going to make sure you get the care you need.” Mendoza was crying now, and Mary nodded forcefully. Soon Mendoza’s expression turned angry. “It’s immoral,” she said. Mendoza’s religious devotion and, arguably, her bare-knuckle politicking can be traced to her roots in Little Village, a Chicago neighborhood that has long been host to a high concentration of families of first- and second-generation Mexican Americans. Family legend holds that after being sent to seminary in Mexico, her father, Joaquin, rejected the priesthood because he saw too much corruption in the church. After immigrating to Chicago, he worked as a pipe fitter, and later a plant superintendent, for Brach’s, the candy maker. The day after the gang killing, her parents moved the family to west suburban Woodridge. “We were a good family, and we got run out of our neighborhood,” Mendoza says. “My mom was freaking out, and my dad, who had a friend near Woodridge, got us out of there.” Soon afterward, the family moved to Bolingbrook, one town over. They continued to return to Little Village to shop and get haircuts. In 2011, after six terms in the General Assembly, Mendoza was elected as city clerk of Chicago. The first woman to hold the post, she won in a competitive election for an office that had previously gone all but gone uncontested to a mayor’s anointed candidate. She ran on a promise to speed service at the often overcrowded clerk’s office and to lower the prices on city vehicle stickers. She accomplished the first goal in part by staggering the expiration dates of the stickers. “I’d say I beat the mayor in that fight and people noticed,” Mendoza says of her tussle with Rahm Emanuel over city sticker prices. Asked whether his recollection of the events matched Mendoza’s, Emanuel was eager to comment: “Susana and I are friends. We’re honest with each other. We had something we needed to work out, and she had an innovation she wanted to try [the more modest sticker price increase that diverted revenue to city libraries], and I wanted to help her. It was a great innovation.” In 2015, Mendoza served as cochair of Emanuel’s reelection campaign. When a special election was held in late 2016 after the death of Judy Baar Topinka, the popular Republican state comptroller, Mendoza seized the opportunity to seek statewide office. She took just six of Illinois’s 102 counties but scored big in populous Cook County, trouncing her only viable rival, Leslie Munger, who had assumed office following Topinka’s death and had Bruce Rauner’s support. (The governor personally contributed $2 million to Munger’s campaign.) The election was widely seen as a proxy fight between Madigan and Rauner. Munger ran ads that called Mendoza Madigan’s “sidekick.” Mendoza labeled Munger the governor’s “lap dog.” Mendoza’s campaign raised more than $2 million; Munger’s raised $9 million, some of which she spread to other Republican candidates. It was the state’s most expensive race of 2016. As of mid-2017, after nearly two years without a budget, debt interest payments, court orders, continuing appropriations, and consent decrees constituted around 90 percent of state spending. In other words, only about one out of every 10 dollars the state was spending demanded a decision by an elected official. Courts and the state’s lenders were ruling nearly all of Illinois’s expenditures. That squeeze left the comptroller with unusual power. When the state’s executive agencies—through the governor’s office—submitted requests (which the state calls vouchers) that state money be paid to the vendors, social service providers, and other entities the state owes, the comptroller was able to dictate the order in which the bills were to be paid. By late May, the lack of a budget had created a backlog of $14.5 billion in vouchers. During the first half of 2017, as the budget battle became superheated, Mendoza hammered away at how fearsome that beast of a backlog would grow unless the state got its act together. She also gave politicians a lesson on the dangers hidden in the arcana of state finance. Perhaps the scariest was an older piece of legislation designed to prod the state into paying its bills on time but which was now making Illinois’s debts even more onerous: By law, many bills over 90 days late must be paid back with interest, which accrues at 1 percent a month. Illinois owes vast sums to a broad range of vendors: health care providers, drug treatment facilities, hospice centers, construction firms, and many others. 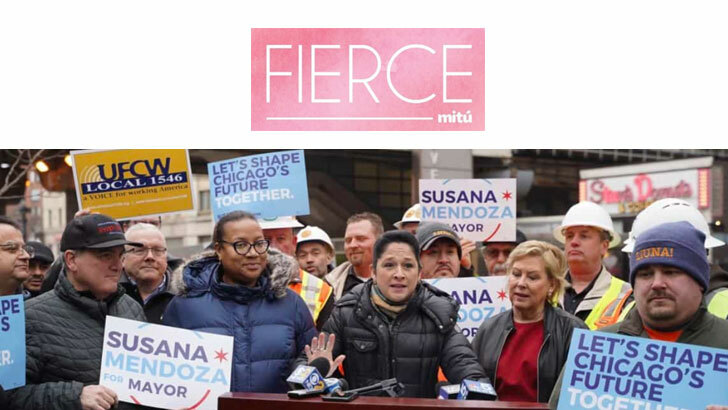 In the dogfight between Mendoza and Rauner, each often accused the other of withholding funds to vulnerable organizations. But Mendoza pointed out that the comptroller’s office could release money only when it received vouchers from the state agencies. Absent a budget, or any appropriations to steer spending, agencies frequently delayed submitting vouchers. For her part, Mendoza put the kibosh on vouchers for some of the governor’s hallmark initiatives—and championed her decision to do so as a victory against an unfeeling administration and in favor of the state’s most vulnerable populations. Such was the case when she withheld $27 million from a $250 million state program to modernize the computer systems that track, among other things, state finances. Comptrollers before Mendoza had lacked that power. In this instance, the governor’s office was emphatic that the tech upgrade was crucial both as a guard against cyberattacks and as a tool to save the state money. Mendoza argued that deep-pocketed companies like the ones the Rauner administration hired to consult on large projects—such as the tech upgrade—could wait for their money. Crain’s Chicago Business estimates that by spring 2017 more than a million people in Illinois were being directly affected by the lack of a state budget. “At some point, someone’s going to die,” Mendoza routinely said, “if someone hasn’t died already.” Before she kicked off her downstate tour, the comptroller held a press conference at West Point Plaza, an affordable-housing development at Damen and Van Buren, and invited home health care workers and service agency owners who had gone unpaid, asking them to share their stories. The tearful owner of a small agency that places caregivers said she was about to lose her business. Many of her workers had stayed on, going months without paychecks. One caregiver said she was close to losing her home. Then Mendoza told the story of an 83-year-old man whose caregiver had found him face-down, bloodied, dehydrated, and lying in his own waste in his bathtub. He had fallen four days before. The arrival of the caregiver—who, according to Mendoza, had been working without pay—likely saved the man from death. Such stories notwithstanding, the governor’s office claimed that Mendoza was being selective with the cases she was moving toward the front of the payment line in order to make the governor look bad. In February, the Rauner-appointed director of the Illinois Department on Aging, Jean Bohnhoff, wrote Mendoza’s office to urge the release of $20 million in hardship money for services to the elderly. Mendoza’s office called Bonhoff’s letter a political move, stating that the comptroller had already released said funds and had prioritized payments for elderly-services agencies in the most equitable possible way, given the absence of appropriations to set spending. Traditionally, the comptroller’s other big job, in addition to processing vouchers, has been to serve as watchdog over the state’s finances, advocating for sound practices and the efficient and transparent flow of money to those the state is obliged to pay. In this respect, the fiscal chaos surrounding the budget infused Mendoza with an evangelical zeal—most notably when it came to the interest payments on the giant backlog. The interest meter is running on about half of the state’s outstanding bills—to the tune of $800 million this year alone, according to the comptroller’s office. For Mendoza, the only thing more galling than the willingness to let the interest-accruing backlog grow was the fact that Rauner’s proposed budgets were conspicuously short on details about both spending and revenue and that—according to the nonpartisan Civic Federation, among others—they did not meet the constitutional requirement to be in balance. What’s more, she pointed out, the governor insisted that he would not compromise on a budget with Democrats unless the legislature also agreed to several of his administration’s top agenda items: pension reform, a freeze on property taxes, term limits for legislators, and rules that would weaken labor unions. Rauner argued that his reforms were needed to attract and retain businesses and to undo decades of overspending, corruption, and legal but sleazy double-dealing. But Mendoza turned that argument against him. One reason she was traveling beyond her comfort districts was to convince voters—business-friendly Republicans in particular—that nothing could be worse for attracting and retaining private enterprise than the state’s budget chaos. “This is a democracy, not a dictatorship,” she said at nearly every stop on her downstate trip, contending that it was wrong to hold citizens hostage, fiscally speaking, in exchange for political reforms not directly germane to the budget. The pressure Mendoza brought to bear on Rauner may well have pushed him to compromise. In the final days of the General Assembly’s official calendar, the governor signaled that he would go to the mat only for his property-tax-freeze proposal and was willing to postpone the fight over the other big items on his list. The cycle of attack and counterattack intensified as the state’s fiscal situation grew more dire. Frequently, it reached beyond the particulars of the budget. In March, the Associated Press reported that Munger earned a $138,000 salary drawn in part from a pool of state health insurance premiums. Following the report, the Rauner administration said the mistake was a “clerical error” and blamed Mendoza’s office for leaking the information. On March 29, Governor Rauner appeared on the radio show of WGN morning host Steve Cochran. When Rauner—who had been running ads featuring duct tape as a prop to disparage Democrats’ patchwork budget measures—complained about Mendoza, Cochran suggested jokingly that Rauner seal Mendoza’s mouth with some of the tape he brandished on TV. The governor didn’t object. Mendoza’s people said he even laughed. At a hurriedly assembled press conference two days later, Mendoza, flanked by clergy and activists, demanded that Rauner and Cochran apologize for their insensitivity concerning the culture of violence against women. Cochran issued a written apology but later argued that Mendoza had exploited the joke for political reasons. Rauner’s camp said the governor didn’t laugh at Cochran’s crack, he coughed. Listening to a recording of the show, it is hard to tell. Regardless, the incident served to raise even further Mendoza’s profile as a fighter. Another stop on Mendoza’s downstate tour was the quiet campus of Southern Illinois University Edwardsville. The school is one of the few public universities in the state with a growing student body. Its sister university in Carbondale has 24 percent fewer freshmen than it did just a few years ago. Because of the budget crisis, state funding for higher education in Illinois has dropped a heart-stopping 63 percent in the last year. Virtually no other state comes close to that kind of decrease. In fact, outside of Illinois, state spending on higher education was, on average, up about 5 percent last year. In Illinois, schools have had to cut classes and personnel. State grants to middle- and low-income students have been delayed. Central and southern Illinois schools serve large populations of Chicago students, and cuts there resonate strongly in Mendoza’s political strongholds. The crunch is also pushing Illinois’s high school grads to leave. Over the past three years, the state has seen a net outflow of 35,000 students. Even at SIUE, the crisis has pinched. Mendoza visited the school’s Small Business Development Center. Its role is to kick-start new businesses in the region. Over the past 10 years, it has helped start or expand nearly 5,000 businesses. In the wake of the budget crisis, however, funding shortfalls have reduced staff and limited the center’s reach. Seven similar centers around the state have closed in recent years. Mendoza launched into her pitch. It was more or less the same one she’d been making in many of her recent public appearances, and the same one she’d be offering during the rest of the trip as she visited newspaper editorial boards, radio stations, union offices, and social service organizations. She made her case for how the governor had neglected his constitutional responsibility and how dearly it was costing the state. Those in the room nodded in agreement. The dean invited discussion on how the crisis was hurting local firms and thwarting business startups. He noted that neighboring states were attracting Illinois companies looking for certainty. SIUE’s chancellor, Randy Pembrook, arrived late to the meeting, charging right to his seat, making no effort at a smile. When he spoke, his tone was ornery. “You’d think that losing students and firms might have moved the government to act on the budget,” he said, “but it didn’t.” He recounted the saga of an SIUE employee whose daughter had suffered severe head trauma in a car accident. Though the girl was fully insured, her mother had struggled to get a hospital to treat her. Because of the state’s poor record on paying medical providers, the girl was refused care until the family could pay for a big piece of it up front. Pembrook replied that there was blame to be shared on all sides. Back in the SUV, Mendoza was cross. “The state’s universities are going to crumble, and sooner or later you hope these guys will take a stand before it’s too late.” She noted that the university chancellors were appointed by the governor and were among the state’s highest-paid employees. She also suggested that they grow some essential parts of the male reproductive anatomy. Mendoza’s pitch grew increasingly barbed, more articulate, and better evidenced at every stop. When she visited a Carbondale shelter for battered women and their children, she learned that its board had recently met to consider what to do if it were forced to close. The nearest shelter is 120 miles away, she was told, and women just won’t go that far. One board member said she feared the closing could result in someone’s death. That gave Mendoza a way to tie deaths to the budget crisis, and she wrapped that scenario into her remarks at the next stops. News of a drug treatment center’s closing and of a tenured SIUE faculty member who had left the state for an adjunct’s job because he couldn’t get health care were eventually worked into her pitch, too. The group stopped for breakfast at the Country Cupboard, a cheery restaurant in Carterville. The special that day: three eggs, three biscuits, and three sausages for $3.50. A group of regulars occupied three tables pushed together in the center of the room. One was a jowly retired coal miner in overalls. Two others were fit-looking men in their 40s who worked for a local trucking firm. Mendoza saw the big table, stuck out her hand, and introduced herself. The diners offered an anemic “Hi” back. The miner cast a wary gaze in her direction. “Did you vote for Trump?” he asked. She said she hadn’t. The man waved a hand dismissively. He said no to that, so Mendoza turned to the other men. She delivered her pitch, and they sat stonefaced for the few minutes it took her to get through it. She talked even faster than usual, trying to get everything in, hitting the lack of payments to health care providers, the reluctance of hospitals to accept state-insured patients, the dependency of southern Illinois, where prisons, colleges, and hospitals are big employers, on government money, and so on. The men tried to speak a few times, but she motored past them until, at last, one successfully interrupted her. It turned out they knew the issues well and could cite the state’s shortfalls and some of the services that had been curtailed. One of the men was married to a teacher, another to a nurse. They were unwilling to put most of the blame on the governor, pointing out that Democrats in the General Assembly were culprits, too. She collected the men’s names and, from two of them, business cards. Mendoza convoked impromptu meetings wherever she stopped. At a Kroger grocery store in Du Quoin, she bought a bag of gummy bears and a bag of dill-pickle-flavored potato chips. The smiley cashier, who looked barely past voting age, noticed the suit coats Mendoza’s aides were wearing. “Are you all visiting?” she asked. Mendoza did not skip a beat. “I’m Susana Mendoza,” she said, “your state comptroller. We’re taking a trip throughout this part of the state to talk about the lack of a budget and to hear from people about how it affects them.” Then she gave the cashier a version of her pitch and asked the young woman to remember her at election time. Before heading back to Chicago, Mendoza and her staff stopped for a late lunch at a bar in Mattoon called Spanky’s. The place smelled like beer and popcorn. Mendoza crossed the room, passing by a group of 10 or so men and women in office clothes seated around a big table. A woman in a white knit dress jumped up. “It’s Susana Mendoza!” she yelled. The woman’s companions started clapping and also stood. Mendoza, stunned, took a step back. If Mendoza’s three-day downstate swing revealed anything, it’s that she’s an adept tactician, turning up the partisan fervor when the occasion seems to call for it and turning it down when it might not serve her needs. Whether she’ll be able to cool the partisan flames enough to ever find common ground with Rauner remains to be seen. A few weeks after the trip, Mendoza attended Chicago’s Polish Constitution Day Parade in Grant Park. She knew the drill. Sporting a bright red dress and a snow-white sweater to mirror the colors of the Polish flag, and full of her usual manic energy, she upstaged the phalanx of other Democratic big shots, most of whom had dressed in dark suits or grim overcoats. As she made her way to her seat, she caught the attention of the U.S. ambassador to Poland, Paul W. Jones, and went over to greet him. A sharp-eyed journalist for one of the city’s Polish dailies noticed the governor approaching—in a white shirt and red tie, as it happens—and ushered him toward Jones and Mendoza for a photo op, creating an uncomfortable moment. At first, Rauner looked like a tenant behind in the rent suddenly face-to-face with his landlord. The photographer pushed the governor and the comptroller together for a picture with the ambassador. He snapped a shot, but the smiles were forced. He gently muscled Rauner and Mendoza together again and got the grins he needed. The photographer looked delighted. For now, even forced amity was a win. View the article: Fishman, T. (2017, June 12). Woman on Fire. Chicago magazine, Politics & City Life. Retrieved from www.chicagomag.com.